NASA's Parker Probe is closing distance with the Sun. NASA has captured the closest ever image of the sun in an attempt to understand how our star works. At the time when the image was captured, the Parker Solar Probe was 16.9 million miles from the Sun's surface. The probe is now 133 million miles closer to the surface of the sun than the Earth which is around 150 million miles away. The bright bob in the center on the image is the planet Mercury, and the black dots are said to be caused by 'background adjustment' from the camera. Astronomers believe that the Parker probe will send valuable data that will help in understanding the mysterious processes of the Sun. 'Parker Solar Probe is going to a region we've never visited before,' said Terry Kucera, a solar physicist at NASA's Goddard Space Flight Center. The space agency hopes to crack three main mysteries that have long bothered the scientists. These include: Why is the corona is 300 times hotter compared to the surface below, What is the reason behind the swift acceleration of the solar wind, and how does the sun eject some particles at half the speed of light. 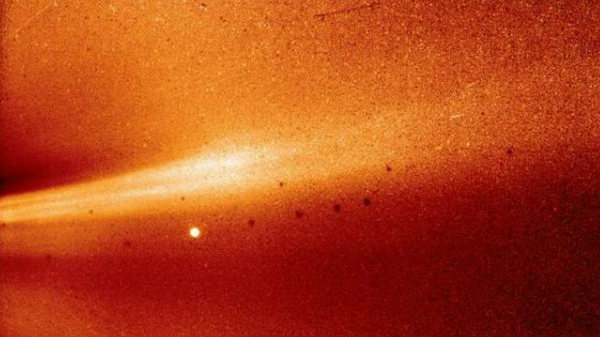 The Parker Probe got within 15 million miles of the sun's surface in November. Another 24 such orbits are planned over the course of the next seven years. The probe will be dipping into the corona, or The Sun's upper atmosphere during the course. The gap will eventually shrink to 3.8 million miles (6 million kilometers). NASA said that the mission will need 55 times more energy that is required to reach Mars.